← Leah Lubin Says: Let’s Get This Party Started…. My first expedition to photograph as many of the Sea Arches of San Mateo’s coast as possible didn’t turn out in the way I had hoped. 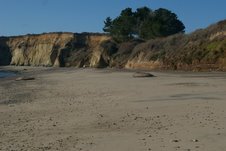 Having shot pictures of an embryonic arch on the north end of New Years Creek’s Beach some time ago, I did a virtual exploration of that area using the large file photos on the California Coastal Records Project website. I thought I could see six or seven arches stretching north from the one I had photographed out to where the Elephant Seal rookeries begin on Ano Nuevo Point. So I decided to start there. With a nice minus .8 tide, I thought I’d be able to get around a couple of the promontories and get some nice sea level shots. Parking along Highway 1, a half mile south of the Park Entrance, I used the “Johnny Don’t Pay,” route along the old road, over the bridge and down the moderately steep path to the beach. You can see this perfectly legal access route in Picture #200506697 on the CCRP website. 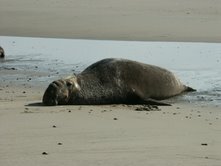 sprawled on the beach. Because they were high up the beach, I was forced to walk along the surfline, trying to keep my distance. I’ve seen the video of these two- ton males blobbing along the sand, faster then most people can run and had no desire to provide a sequel to the Tiger incident recently in the news. Noticing that several of them were mature, heavily scarred behemoths, I assumed they were probably losers in the fight for harems that’s going on in the rookeries now, and not in a good mood. With these thoughts beginning to deflate my arch-documenting ambitions, I continued north until I approached the point where I was going to have to pass through a gauntlet of Elephant Seals, with one lying at the edge of the surf and another higher up on the beach. That’s when I decided I should turn around and explore south of the Park along Bradley Beach. against which powerful waves challenge the supremacy of our continent. 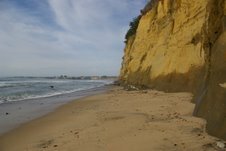 And for more then a half mile after that, there’s no legal escape up the cliffs until you reach Alligator Rock at the foot of Waddell Bluffs, just beyond the border of San Mateo County. “Ghost nets are fishing nets that have been lost by fishermen. These nets are left to drift the oceans of Earth entangling sea life and causing varying degrees of damage throughout Earth’s oceanic ecosystem. 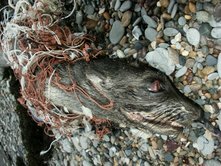 A vast array of sealife is harmed by these lost nets, harming both vertebrates and invertebrates, including many different species of marine mammals. a few years ago. It had probably been cavorting in the kelp forest with the joyful exuberance I’ve often seen in underwater photography when it became entangled in a piece of netting. Based on when I found it and the season its species are born in, it must have slowly starved to death over a period of months as the relentless piece of net tightened its grip. This pup may have been the first born of its species in this area. The Guadalupe Fur Seal was hunted to assumed extinction only to recover from a hidden population on its home island off the Mexican coast. Protected from exploitation, its numbers have since recovered and its range has expanded, first to the Channel Islands and recently to the Farallones. The famous Ray Bandar came to collect the corpse, performed the autopsy and made the identification. I was watching a DVD about him and his unparalleled collection of marine mammal skulls this evening. At one point he was discussing a sub-collection of his skulls of marine mammals, those killed by humans. I was almost nauseated when he discussed several that had strange gashes in them. He had originally thought they were caused by the propellers of boats, but forensic investigation revealed that the line of nets the marine mammals had become entangled in, had slowly sawed through fur, and skin and finally bone, to leave the gashes in their skulls. The one where the skull had partially regrown to seal the line inside the skull of the still-living animal particularly assaulted my imagination. 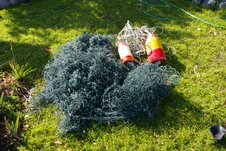 The last picture is of the net resting on my lawn after cleaning, its terror spree finally stopped. That is until my neighbor’s young cat, attracted by my untangling efforts, got its head stuck in the web and totally freaked. This entry was posted in Ghost Net, Guadalupe Fur Seal, John Vonderlin. Bookmark the permalink.